As a practice who offers Silhouette Instalift, we constantly receive questions and concerns from our patients about the procedure. We have put together the most frequently asked questions and answered them for you on this blog. What are the results of Silhouette InstaLift®? Changes in the shape and appearance of the face happen gradually over time. These changes occur as skin strength and elasticity decrease with age, as well as due to the gradual loss of fat, bone, and cartilage. Silhouette InstaLift® is a minimally invasive cosmetic rejuvenation device that provides an instant lift to aging skin in the mid-face area and restores lost facial volume by stimulating collagen production for a more youthful appearance that continues to improve over time and lasts up to 2 years. How does Silhouette InstaLift® work? Silhouette InstaLift® uses the latest micro-suspension technology, MST, to lift the mid-face area while simultaneously activating the creation of natural collagen to boost volume. What are Silhouette InstaLift® sutures made of? Silhouette InstaLift® is made from a well-known polymer that is frequently used in medical devices and is well tolerated by the body. Who might be interested in Silhouette InstaLift®? 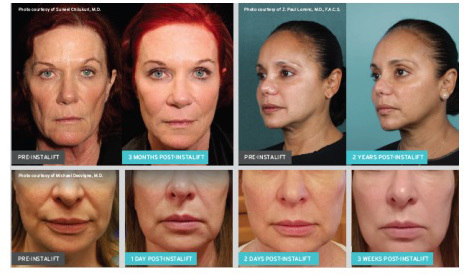 Those looking for a quick, minimally invasive option to restore their mid-face’s youthful lift and volume without fillers may be interested in Silhouette InstaLift®. How much downtime is needed following the procedure? Following treatment with Silhouette InstaLift®, patients may experience minor pain, swelling, and bruising. Recovery time is minimal, with most patients returning to normal activities within 2-4 days. Please note that individual results may vary. If you have any questions or would like to schedule your complimentary consultation, please contact us at (561) 404 – 4050.